Supplements its palace intrigue with the good old-fashioned pull of romance and costume drama...Mikkelsen's magnetism and sly expressiveness hold the film's center with a quiet potency. 137 min. Magnolia Pictures. Director: Nikolaj Arcel. Cast: Alicia Vikander, Mads Mikkelsen, Mikkel Boe Følsgaard. The new historical drama A Royal Affair helps us to remember what should be obvious: history is in the making every day, in cycles of doomed repetition. Just ask David Petraeus. The red meat Petraeus has provided to ravenous media outlets has created a feeding frenzy, one that reduces a man's worth to unpleasant but commonplace sexual missteps. Yes, the mighty fall easily, but at least Petraeus doesn't have it as bad as Count Johann Friedrich Struensee of Denmark, who had the poor form to fall in love with a married queen. Denmark's official Oscar submission for Best Foreign Language Film transports audiences to 1766 Copenhagen, where a freshly acquired British princess becomes Queen Caroline Matilda (Alicia Vikander) to King Christian VII (Mikkel Boe Følsgaard). A hopeful innocent, the teen queen quickly discovers she's incompatible with her demonstrably spoiled-childish husband, who drinks, whores, and lives on the edge of insanity. That last concern allows a couple of rejected courtiers to regain favor, by presenting their candidate for the job of personal physician to the king. This is Struensee (Mads Mikkelsen of Casino Royale), the only doctor who manages, with irreverence and good humor, to insinuate himself with the wanton Christian. As a canny social mover, Streunsee observes and listens to the affairs of state and swiftly recognizes that the addled king has all but ceded authority to the council of state, full up with self-satisfied power brokers who rule as they see fit. Meanwhile, Matilda strikes up a friendship with Streunsee, and in spite of better judgement, their spark of chemistry catches fire. Though the affair should make the couple more fearful, it seems to embolden them to pursue their common political aim of a progressive Denmark. If the council of state can effectively usurp sovereign power, Streunsee reasons, why not him, on behalf of Enlightenment idealists? It's a dangerous game, on political and personal levels, with incredibly high stakes: the fate of a country, and the livelihoods and lives of those who could be accused of treason for legislatively and sexually circumventing the king. Working from Bodil Steensen-Leth's novel Prinsesse af blodet, director Nikolaj Arcel (who scripted the Danish film of The Girl with the Dragon Tattoo) and co-writer Rasmus Heisterberg nimbly steer the narrative, keeping the characters' ambitious and romantic motivations clear and relatable. And of course, A Royal Affair supplements its palace intrigue with the good old-fashioned pull of romance and costume drama. Though narrator Caroline Matilda somewhat comes off as a swoony zero, Vikander is never less than believable. Certainly the stage actor Følsgaard keeps Christian colorful, and Mikkelsen's magnetism and sly expression hold the film's center with a quiet potency. Ultimately, the exhilaration of new love and political action contends with the audience's dreadful certainty that the truth will out and devastate these characters, giving A Royal Affair a productive tension that insures its history lesson will not be forgotten. 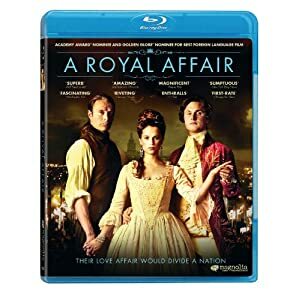 Magnolia Home Entertainment delivers a pleasing special edition of A Royal Affair on Blu-ray. Picture quality is excellent, with a spotlessly clean film source that promises a natural-looking, textured, and yet detailed hi-def image. True hues and calibration prove accurate to the filmmakers' intentions, which skew toward period evocation with a slightly soft effect from the lighting and contrast. Perhaps most importantly, no compression artifacts mar the image, for an experience that's as close to the theatrical one as possible. That's also true of the lossless DTS-HD Master Audio 5.1 surround mix, which proves surprisingly detailed and discrete in its separation and placement of effects to create an aural landscape. The ambience helps set both indoor and outdoor scenes, while the music sounds entirely full-bodied and the dialogue always clear and prioritized (with default but optional subtitles, of course). Bonus features are on the slim side but best in set goes to "Interview with Mads Mikkelsen, Nikolaj Arcel and Alicia Vikander (33:05, HD), a fairly in-depth chat conducted at the 2012 Berlin International Film Festival. Other than the "Theatrical Trailer" (2:01, HD), the rest of the extras are text-based: "Portraits & Biographies" (HD) of Christian VII, Caroline Mathilde, and Johann Struensee, and "Royal Family Tree (HD), which displays the intertwined branches of the respective family trees of the English and Danish monarchies (from 1760 to today). All site content © 2000-2019 Peter Canavese. Page generated at 04/17/2019 05:42:59PM.